Please go to Start>Run type in Notepad. Copy what is in the code box below into the open Notepad window. Change the "Save As Type" to "All Files". Save it as fixthis.bat on your Desktop. 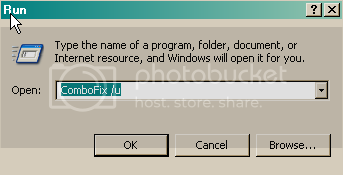 Then please double click on fixthis.bat a window will open and close quickly.This is normal. HKEY_CURRENT_USER\Software\Microsoft\Windows\CurrentVersion\ADP (Rogue.Multiple) -> Quarantined and deleted successfully. C:\Documents and Settings\Owner\Application Data\Desktopicon\eBayShortcuts.exe (Trojan.Agent) -> Quarantined and deleted successfully. Attach that information in your next post. Tony Klein article To find out more information about how you got infected in the first place and some great guidelines to follow to prevent future infections you can read this article by Tony Klein.